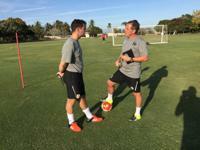 The training trip to Mexico is a unique opportunity for Sacramento Republic FC to focus on fitness and team bonding. It’s 6:45 a.m. and the sun is just rising, but Sacramento Republic FC’s players, coaches and football operations staff are wide-awake and ready to go for a three-mile run along the beaches and golf course at Estrella Del Mar Resort in Mazatlán, Sinaloa, Mexico. Just one week into their official 2016 preseason training camp and Republic FC are already focusing on their priorities to prepare for the USL season ahead: fitness and team bonding. The run is the first of three training sessions a day for Sacramento Republic FC during their five-day trip to Sinaloa, Mexico, which is serving as a crash-course in readying the team for the long seven-month USL regular season ahead. The intense training schedule includes a daily run every morning, two training sessions and a swim in the ocean. 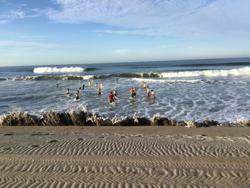 Republic FC players swim every day in the ocean as part of week-long intensive training camp in Mexico. “We want to be the most fit team in the USL,” said Strength and Conditioning Coach Luke Rayfield to Good Day Sacramento about the club’s preseason goals. After the run, the team spends some time swimming in the ocean and refueling before hitting the pitch for a two-hour training session from 10 a.m. – 12 p.m. at a training facility used by Liga MX clubs Santos Laguna, Club Tijuana and Dorados de Sinaloa. “It’s a really good venue, and [we’re doing] three or four sessions a day. I think it will put us in the best position to be ready to put on a good show in our first game at home,” said Head Coach and Technical Director Paul Buckle to The Sacramento Bee. With several new faces joining the squad, Republic FC is using the down time between training sessions for both rest and team bonding activities. “We’ll have a few new faces on the squad and going away, and spending time together morning until evening should cement some good relationships,” said Buckle. Aside from new faces joining the squad, Republic FC is adding new training technology to their preseason training camp to further help players maintain and increase their fitness. During Republic FC’s training sessions in Mexico, each player is wearing Playertek, a performance tracker with GPS, that allows the football operations staff to collect data on overall distance, top speed, heart rate and other key performance analysis data. Throughout the season, Republic FC players will also wear the Playertek pods during runs, training sessions and matches to train at a pace that drives both overall conditioning and technical improvements, and sustaining them throughout the season. Republic FC return home on Thursday, Feb. 11, just in time for a pre-match training on Friday ahead of their first preseason friendly of the 2016 season on Saturday, Feb. 13. The quick turn around with travel is another opportunity for Republic FC to evaluate their preparedness for the preseason. The club will host the Colorado Rapids (MLS) in their first preseason friendly of 2016 on Saturday, Feb. 13 at 5 p.m. at Bonney Field. Tickets are on sale at Ticketmaster.com.